The VESA-compliant DDR1327SDFC dual full motion flex arm desk clamp attaches to your desk, table or workstation, allowing you to mount two monitors above it and free up valuable workspace. Ideal for home and office, the DDR1327SDFC fits most flat-panel displays from 13 to 27 inches.Dual swivel arms can be independently adjusted for angle to give you maximum flexibility in positioning your monitors to fit your environment and comfort level. Move a screen closer to you, or push both screens out of your way when not in use. A 180° swivel and -15° to +15° tilt capability minimizes glare and provides comfortable viewing from multiple angles. A 360° rotation lets you view your monitors in portrait or landscape orientation.Durable clamp attaches to most flat surfaces up to 3.5 inches thick for a firm grip, or install it using a desk hole up to 2.75 inches in diameter. Each swivel arm supports up to 10 kg (22 lbs.). The durable all-metal frame with scratch-resistant powder-coated finish tolerates frequent handling and blends with any décor. Mounting hardware is included. Conforms to VESA-compliant displays with any of the following mounting hole patterns: 75 x 75 mm and 100 x 100 mm. 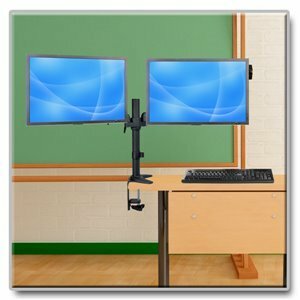 Tripp Lite’s VESA-compliant DDR1327SDFC Dual Flex-Arm Desk Clamp frees up valuable space in your workstation and increases workday productivity by enabling the suspension of two flat-screen displays on a single adjustable clamping base. Its unique, flexible design offers an exceptional range of motion and allows monitors to be placed back-to-back for use by more than one person. Other features include convenient one-touch display adjustment with tilt, swivel and rotation capabilities and fits most 13- to 27-inch flat-screen displays. Its durable, all-metal frame with scratch-resistant, powder-coat finish withstands the stress of repeated use and blends easily into any décor. It comes with all necessary mounting hardware, and each mount supports weights of up to 22 lbs. For peace of mind, the DDR1327SDFC comes backed by a 5-year warranty and green, RoHS-compliant design. The DDR1327SDFC adjusts to optimize viewing angles and makes the most of your display environment. Its flexible design allows monitors to be placed back-to-back for use by more than one person. It upgrades existing displays with a -15° to +15° tilt range, 180° swivel and 360° rotation capability to minimize glare, provide comfortable viewing angles, reduce fatigue, and increase productivity. VESA (Video Electronics Standards Association) is a professional organization whose purpose is to promote uniformity in the video electronics industry by developing industry-wide interface standards for a wide variety of products, including flat-panel TVs and monitors. Most manufacturers of these products comply with these standards by adhering to a series of universal mounting hole patterns on the backs of the products. The DDR1327SDFC is guaranteed to work with VESA-compliant displays with hole patterns of 75 mm x 75 mm and 100 mm x 100 mm. In order to ensure that the DDR1327SDFC is right for you, measure the vertical and horizontal distances between the holes on the backs of your displays or refer to your displays’ owner’s manuals. The DDR1327SDFC comes with all the hardware you need for installation. Setting it up couldn’t be easier. Simply assemble the DDR1327SDFC with the hex keys provided and place it on your desk, clamp the unit to your desk or table, attach your displays and you’re ready to go! The DDR1327SDFC is manufactured in compliance with strict RoHS specifications, reflecting Tripp Lite’s commitment to environmental responsibility. For peace of mind, it comes backed by a 5-year warranty.